Once upon a time, my One and Only set out to walk the Pennine Way. This is a challenging, long-distance track that lumbers painfully up the spine of England from Edale, in Derbyshire’s Peak District, north through the Yorkshire Dales and Northumberland to finish, muddy and weary, just across the Scottish border. It was a tough, exhausting slog, and an adventure from which I was more than happy to abscond. Yet, two weeks later he bounced home again, like Tigger, with a new mission. This time I should come with him. He had found another long-distance trail: Wainwright’s Coast to Coast. This path would take us across the north of England, from the Irish Sea that pummels the coast of Cumbria, to the North Sea that bludgeons the Yorkshire beaches, traversing many of the glories of the Lake District, the Yorkshire Dales and Moors en route. Alfred Wainwright first published his pocket-sized, hand-written book in 1973, just a year after he had walked the route himself. It has been updated at least twice since then, but we travelled, in eons past, with the original version. Dedicated to ‘the second person (unidentifiable as yet) to walk from St. Bee’s Head to Robin Hood’s Bay,’ the book simply connects the public walking tracks in ‘an approximate beeline’ from west to east. 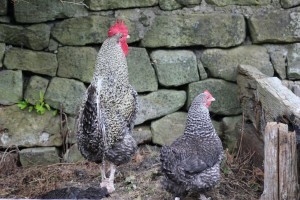 While Wainwright firmly states in his introduction that ‘this is in no sense an official route such as the Pennine Way,’ in the intervening decades, his particular trail has become sacrosanct for the flocks of keen, ambitious, long-distance walkers who have traipsed across the country in his wake. I was dubious about such a venture, but after I was promised the unheard of luxury of B&B accommodation instead of the requisite two man tent, I was sold. A real bed to sleep in and a full English breakfast to start the day? A pub meal at night and the possibility of a hot bath to soothe aching bones? Done. I noted in my journal ((back in the days when I kept one), that it was hard not to look a little smug as we trudged blithely through the London Underground during the morning rush hour. Decked out in our hiking boots and lugging unwieldy rucksacks, we wedged ourselves in among the pristine suits and the polished shoes, ignoring pursed lips, tutting sounds and raised eyebrows. I couldn’t have cared less for their disapprobation. After several months of suffocating, self-flagellating, insecurity working in a tightly knit and xenophobic London Publishing House, I was euphoric to be fleeing the city, in search of adventure. While my journal hardly makes scintillating reading, it was a lovely reminder of what we achieved over the following fortnight. By the time we had crossed the country, we had acquired a battalion of blisters and lost all interest in any further carbohydrate-heavy pub meals, or full English breakfasts. But we had delighted in the scenery, the fresh air, the birds, beasts and wild flowers, and the quirky characters we had met along the way. Last month we found ourselves back at the eastern end of the walk, in a small village we had passed through twenty-five years before, on the penultimate day of the Coast to Coast, which had seen us trudging nineteen miles along a disused railway track from Clay Bank Top. We tottered into town after a full day on the moors, during which, apparently, we had got quite giddy over the panorama across miles and miles of moorland. ‘Heather, old and new, dead, burned, interminable,’ I wrote then. When we had finally wended our way down from the ridge to the village, we found a slice of heaven in the form of a high-ceilinged blue and white bedroom in an old farmhouse, with a view across the valley to die for. Wainwright describes Glaisdale as ‘not in itself pretty… but its setting is delightful [and] luxuriantly wooded.’ Today it is much the same. This time, we were again equipped with hiking boots, but we also had a car, which allowed for a different level of exploring. Courtesy of my dear sister-in-law (my unofficial travel agent), we were back in Glaisdale, staying in converted stables overlooking another glorious green valley. As we drove into the farmyard, we were welcomed by a strident and extremely cocky California Grey rooster, who pranced about the farm yard, regaling us with fulsome tales of his nobility. 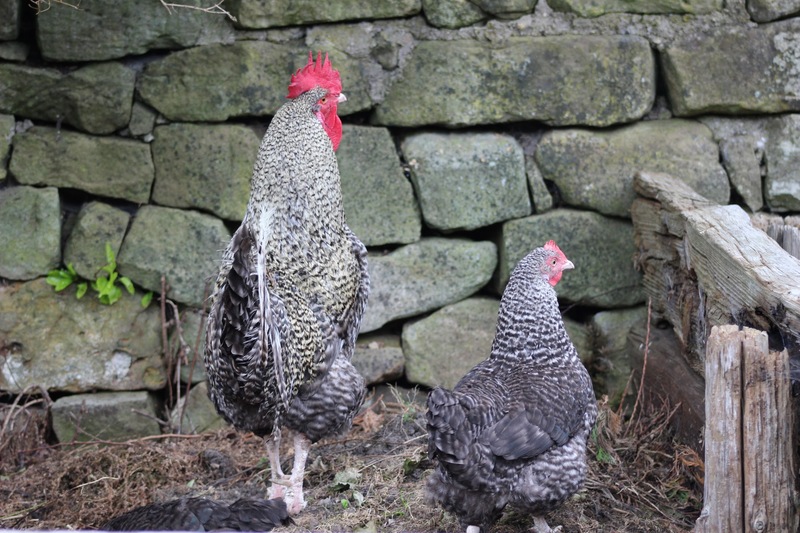 In the shadows, his two dowdy wives fluffed about nervously, shepherding their half-grown chicks out of sight. Glaisdale, once a small farming community, expanded during the 19th century, when iron ore was discovered in the surrounding hills. At the foot of the hill is the River Esk and a pretty stone bridge built by a local farmer in memory of his wife. The village shambles up a steep hill from the railway station, and the views get bigger and better as you climb. 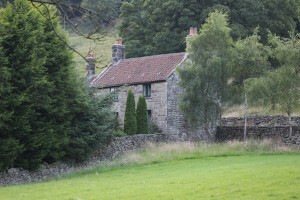 One fine evening – I do love the long summer days in England – we found our way to the moors and along Glaisdale Rigg. We walked through fields hedged with grey stone walls. We chatted with the curly-horned, black-faced sheep, some of whom had wrapped themselves up in ribbons of green tendrils as if for a party. We watched carefully for skylarks and curlews on the tops as we trudged past heather and fern. The sense of space up there is awesome, especially for a couple of Aussies used to more elbow room than England commonly has to offer. This stretch of wild, open moorland is encompassed by the Yorkshire Dales National Park, over five hundred square miles of moors, valleys, hills and villages. 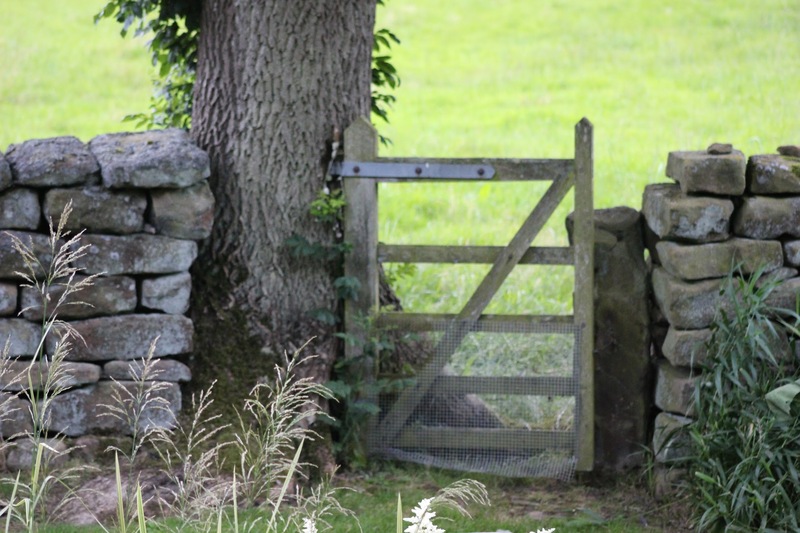 Many of the place names we came across in North Yorkshire were eye-catching and imaginative, and often inclined to make us giggle: Crunkly Ghyll, Fryup, Fangdale Beck and Hutton-le-Hole, to name but a few. And then there was the aptly christened Limber Hill that winds steeply, almost vertically, up from the Esk. We walked a lot that week, but we also drove often to the coast, where we found surprising stretches of sand and some brave young surfers edging tentatively into the steely grey waves of the North Sea. 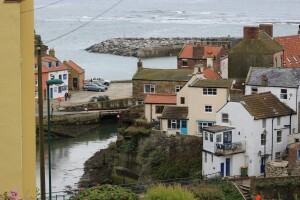 Quaint fishing villages spill down the cliffs to deep harbours. We came across one such town by chance, after missing the Sainsbury’s at Whitby, and headed back the next day for a better look. We arrived in the rain, and like all good English people, we parked in the clifftop carpark and ate our picnic lunch in the car, before venturing down the precipitous cobbled street, slick with rain, into the town proper. Living here would certainly keep you fit, we thought. The terraced houses that clamber down the hill to the quay are pocket-sized, slender and tall, and many have been converted into holiday homes. Every rocky ledge or outcrop has been transformed into a modest patio or tiny terrace. Staithes, once a thriving fishing port, has now become a miniscule Mecca for local artists. Kempt fishing boats, or ‘cobles,’ lay on tidal sands within the harbour, and feature in many of the paintings on display in the local art galleries. Staithes also lays claim to our own Captain James Cook, who lived there for a year or so as a grocer’s apprentice. Then, having fallen in love with the sea, he moved south to Whitby and joined the Royal Navy. Despite this somewhat tenuous and momentary relationship with Staithes, Captain Cook now has a pub and a local cottage named in his honour. We resisted the temptation to fill our backpacks with artwork, before clambering back up the hill to the car, promising ourselves a pub and a cider if we made it to the top. Glaisdale once boasted three pubs. In recent years, these have diminished to only one, and that one did not come highly recommended by our host. Instead, returning through winding back lanes from the coast, we dropped into the local pub in a neighbouring village: The Board Inn at Lealholme. This old staging inn squats beside the River Esk. Opposite, on the village green, the locals play quoits. We would happily have settled in for the evening, watching the river from the terrace, like Ratty and Moley, and listening to ‘the sound of the wind in the reeds and willows.’ But the pub had been requisitioned by local mourners for a wake, so, after a quick cider, we headed home to drink a glass of wine less guiltily by the pond at Red House Farm. *Photos, as always, gratefully borrowed from the camera of the One & Only! This entry was posted in England, Travel and tagged Coast to Coast, Cumbria, Glaisdale, Lake District, North Yorkshire, Staithes, Wainwright, Whitby Lealholme. Bookmark the permalink.